Before we begin, let's set the stage. The purpose of this interview series is to inspire and encourage millennials to take the leap into entrepreneurship or give advice to those currently on the journey. This series will highlight millennial entrepreneurs in a wide range of industries who are offering services, products and resources to their audiences. Throughout the next couple of weeks you will have the chance to read the stories of millennial trailblazers who are designers, social ambassadors, photographers, and more. I hope you are inspired! Tell us a little bit about yourself and what you do. I am a fourth year industrial engineer at Georgia Tech. Currently, interning in the corporate world. I was born in Maryland. One random fact about myself is that I've been skydiving twice, so I'm a bit of an adrenaline junkie. When I'm not attending classes or taking random adventures, I spend time immersing myself in the music scene here in Atlanta by singing and going to concerts. What is one quote you live by? Give an example of how you have applied this quote in your journey. This quote has resonated with me since the first time I heard it. It speaks to the leap of faith that a lot of entrepreneurs know they need to take, but aren't ready to because of fear or other circumstances. Personally, after interning for three summers with two different companies in the corporate world, I'm realizing that while there are major perks (i.e. stability and good benefits), this is not how I see myself spending the rest of my life. Each of the major companies that we work for started from one person with one idea, a strong work ethic, and incredible execution. It may seem difficult at first, but there is always a way to merge your passions and skills with the needs of the world. If you truly love what you do, success will be a byproduct. What does The Diamond Campaign do? What problems or pain points are you trying to solve through TDC? 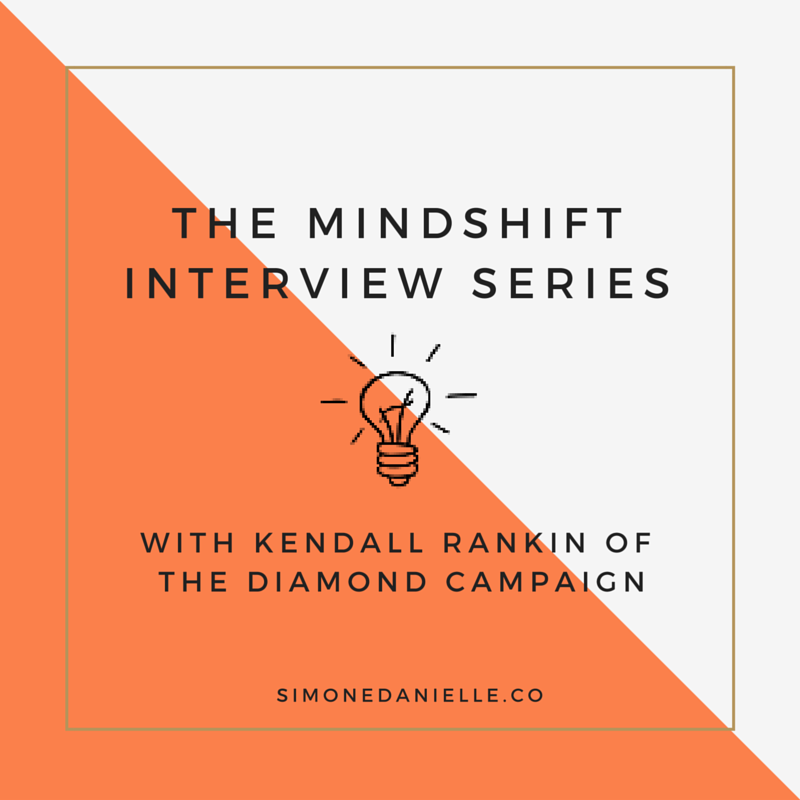 The Diamond Campaign is a self-love initiative created to empower all women to embrace their unique cut (body image), color (personality), carat (self- worthy), and clarity (vision for the future). We believe that a woman's confidence is the foundation of her academic/professional success, emotional well-being, and mental and physical health. How did TDC come to form? What was the idea that started it all? TDC started from a conversation during my freshman year between my roommate, Morgan, and I. We had been discussing a non profit she founded in high school called The Purple Comma Project. I told her of how I would love to start something similar with an emphasize on personal development and self confidence for young girls. From there we started brain storming ideas and I sent out a survey to the BSO email list. The response was amazing. So many people loved the idea and wanted to help. We arranged for a meeting soon after to discuss ideas, possible collaborations, and establish a team. What is one of the biggest myths you've found to be untrue from running your non profit? One of the biggest myths about non-profit organizations is that you cannot generate funds. Obviously that can't be the main goal of this type of organization, but it's important to note that you can build a career and support yourself working for a non-profit. The salary may not be as high as someone working as an investment banker or a consultant, but the overall experience may be a more fulfilling opportunity for you. What tools or systems are a necessity for running TDC? Google drive and Google forms. These are key. We use them for everything to registration forms to sign ups. I know it may sound basic but it's simple and keeps us organized. What marketing strategies have you used to attract new leads and spread the awareness of TDC for business growth? Social media has been huge for us. The main platform being Instagram. We do have social handles on facebook and twitter. However, Instagram is where we see the most engagement. Through the use of challenges and announcements of upcoming events, we have been able to increase our awareness and attract new supporters. And word of mouth marketing is another source of traffic for us. What are some accomplishments of TDC? Where do you see its future? I am super proud of The Diamond Campaign and my team as a whole. We have obtained several monetary awards one of which being The GA Tech Student Foundation award. This award required us to go through a lengthy interview process, give a 10 minute pitch, and more. However, in the end we prevailed and was awarded $1,640 in funds. We've also been able to partner with a local school named Crystal Rae near campus and launch a very successful mentor-ship program. We were able to have a over night retreat with the girls and the feedback has been amazing. Can I share a success story? [Of course, Kendall!] One of the girls who had become very active in our meetings gave us all a shock to say the least. You never really know what a child experiences at home, you only see what they allow you to see. Back to the story, this young girl gave us all a scare. She got into a serious incident and had to be hospitalized. She had become extremely close to her mentor, and our mentor was one of the first people she called in the hospital. I say all this to say, in this short amount of time, TDC is having a real impact. In the future, I would love to raise enough money to take the girls on a service trip. As well as, host a couple more challenges. Our vision of TEDTalk aka TDCTalk had a great turn out. I would like to kickstart the Fall semester with another. What advice can you give to other entrepreneurs? Stay on target. I am one to have an abundance of ideas. However, not all of my ideas benefit or are on target with TDC's mission. I have learned to sort through my ideas and consistently be sure I remain with in the vision, mission, and guidelines of TDC. Build a team. Teamwork has been vital for TDC. It is important to seek the right help in order for the business to grow. I know I can not do this alone. My strength can not be in everything. I do not have all the ideas. I describe a Mindshift as a moment in time, where one realizes, there is more to life than what society has lead us to believe. Describe a Mindshift moment on your journey. During one of our TDC sessions with the girls, we required everyone to read aloud a positive trait another girl saw in her to the group. After the session, I went up to one of the girls and told her, I had written the comment she read. Her whole face just lit up as we exchanged a hug. In this moment, I saw the impact. My Mindshift was realizing the confirmation of my love for people and empowering the well being of women. Think of what living life on your own terms means for you. Describe your ideal situation. My ideal situation would be running TDC as a large non profit across the nation. Think along the level of The National Beta Club Organizations or The 4H Organizations in schools. I want to be very involved in the organization as it grows, so having the opportunity to travel and visit different chapters would be great. I know the value of building on connects and networking relationships. This would increase our investments, in order to continue to grow and impact millions of lives via our personal development initiatives. Of course my plan includes a husband and kids a few years down the road, after I've set a great foundation for myself! 6 Things You Should Know About Growing Your Brand.